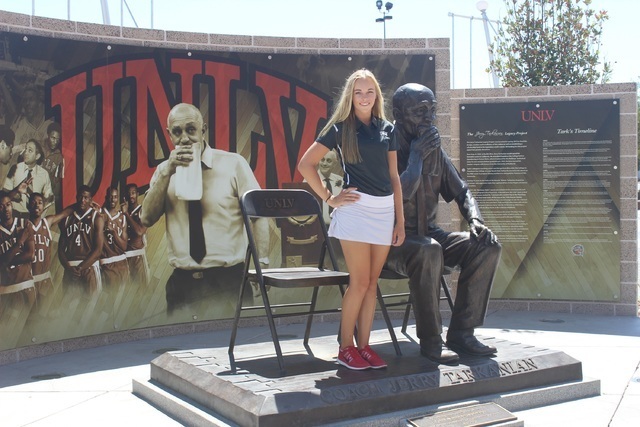 Veronica Joels, a junior at The Meadows High School, orally committed to the UNLV women’s golf team for the class of 2018. She would be one of the program’s most heralded recruits. Local junior golf star Veronica Joels has had a pretty good run recently. Last Thursday, she won the IJGA World Stars of Junior Golf tournament at TPC Las Vegas. She shot a final-round 69 and birdied the first playoff hole to defeat Jenny Han of Thailand. The event featured players from all over the world. Then on Friday, Joels, a junior at The Meadows High School, orally committed to the UNLV women’s golf team for the class of 2018. She would be one of the program’s most heralded recruits. Joels has won 99 junior golf tournaments, according to statistics kept by her father, Doug. Perhaps her most impressive victory came in 2013 when she won the 13-year-old division of the U.S. Kids World Teen Championship at Pinehurst in North Carolina. Besides her physical talents, Joels relies on her mental approach on the course. Per NCAA regulations, Rebels coach Amy Bush-Herzer was unable to comment on Joels until she signs her letter of intent. Longtime general manager Chad Gunier has left the Las Vegas Paiute Golf Resort to move back to his native Texas. He had managed the resort since 2007 and also was active in the local PGA of America chapter. Taking over for Gunier is Jeff Reid, who previously served as director of golf course maintenance for the three courses. Reid has more than 25 years of experience in the industry, including 11 at Paiute. Reid helped spearhead the rebuilding of the courses after devastating flooding in 2013. Many thought the courses were destroyed beyond repair, but Reid and Gunier worked tirelessly after the flooding. All three courses returned to playability in a few months. During that span, Reid was hands-on and rarely left the resort. Also helping during the renovation process was Jeremy Shay, who will replace Reid as director of golf course maintenance. Shriners Hospitals for Children Open tournament management announced that police, fire, EMT and active and retired military personnel will receive free admission to the PGA Tour event from Nov. 3 to 6 at TPC Summerlin. Several pros with ties to Las Vegas will compete in the PGA Championship beginning Thursday. Former UNLV players Adam Scott, Charley Hoffman and Ryan Moore are in the field, as are residents Scott Piercy and Kevin Na. Alex Cejka was recently spotted at Las Vegas Country Club working on his putting with UNLV men’s coach Dwaine Knight. Cejka finished fifth in the RBC Canadian Open last weekend. He also made the longest putt on the PGA Tour this season, an 84-footer on the 18th green during the third round. The golf notebook runs on Thursdays. Freelance writer Brian Hurlburt is a two-time author who has covered golf in Las Vegas for more than two decades. He can be reached at bhurlburt5@gmail.com or @LVGolfInsider.